I am experimenting with Arduino / Genuino and ESP8266. I wanted a spare USB TTL 5 and 3.3 V interface and found this interesting device/circuit on Aliexpress. Due to it's interesting features and its price (in June 2016 it even dropped below 3.00 Euro!) i wanted to give it a try. I ordered it and received it after some time together with other interesting hardware. 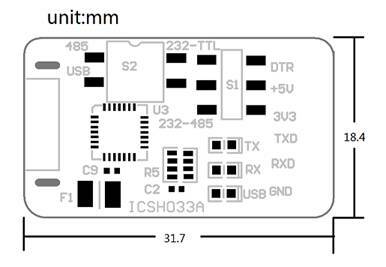 - A USB 2.0 to TTL UART 6PIN CP2102 Module Serial Converter. Connect MCU easily to your computer! This item uses the USB to serial chip CP2102, it has the advantages of high-speed, stability, small size. 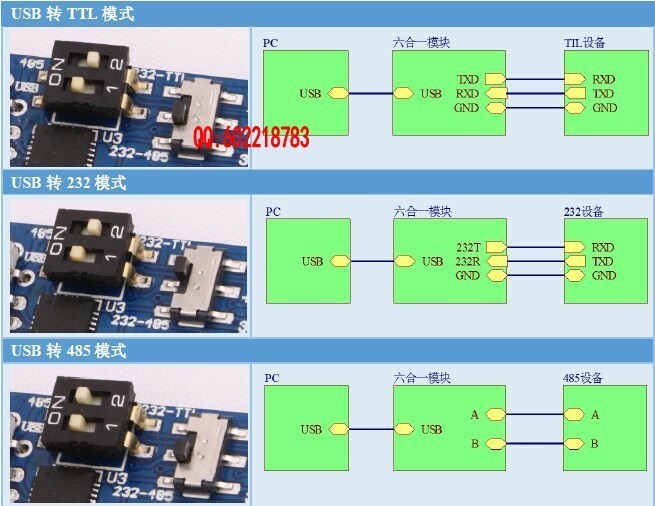 It can help realize the equal energy level interconversion of the USB/TTL/RS232/RS485. It is the essential tool in communication debugging. .Small size: the PCB board size is just 3.1CM*1.8CM, it is even smaller than the U disk. 3.3V and 5V voltage: can use this module to provide power suppler for the Microcontroller , the max output current is 500ma. Over current protection: on-board recovery fuse, it can protect the Microcontroller and the PC from the damage of the Short Circuit. The fuse will automatic shutdown and will be work normally after the recovery of the circuit. Indicator LED: When begin data transmission, the indicator LED will light. 485 level interface: Automatic transceiver control no need for the control line. Default receiving state, when sending data, the state will be changed into sending state. 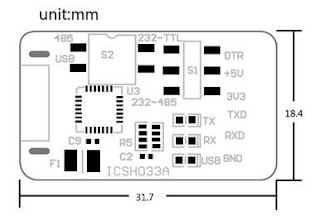 USB, TTL, RS232,,RS485 four electronic levels free transfer: unique circuit design, uses the switch to realize the functions conversion, it is very fast and convenient. Stable communication rate: The max rate is 1Mbps. - USB specification 2.0 compliant with full-speed 12Mbps. - Standard USB type A male and TTL 6pin connector. 6pins for 3.3V, RST, TXD, RXD, GND & 5V. - All handshaking and modem interface signals. - Baud rates: 300 bps to 1.5 Mbps. - Byte receive buffer; 640 byte transmit buffer. - Hardware or X-On/X-Off handshaking supported. - Event character support Line break transmission. - USB suspend states supported via SUSPEND pins. - Temperature Range: -40 to +85. - Supports Windows 98SE, 2000, XP, Vista, Window7, Mac OS 9, Mac OS X & Linux 2.40. I did not test this yet. This is only some text i found in "internet documentation" ! Use the Dupont line to connect the TTL-TXD and TTL-RXD of this module, place the dial switch according to the function introduction, then insert this module into the computer, uses the serial debugging helper to send the data, check whether there has corresponding back data. If it can receiving the receiving data, it proves that this module can work normally. Use the Dupont line to connect the 232-TXD and 232-RXD of this module, place the dial switch according to the function introduction, then insert this module into the computer, uses the serial debugging helper to send the data, check whether there has corresponding back data. If it can receiving the receiving data, it proves that this module can work normally. The default state of the black two dial switch is "ON", it is suitable for all conditions.